“That one time when violence is the answer, make no mistake, it will be the only answer”—a timely survival manual for life in a strange era. Violence is always the last resort. That said, given a time of slashers on city buses, shooters in the streets, and a politics of division and hatred, to say nothing of the usual mashers and bullies, it’s useful to know how to take down a threat. The necessary precondition, writes security expert and former military intelligence officer Larkin (Survive the Unthinkable: A Total Guide to Women’s Self-Protection, 2013), is what might be called situational awareness. “Listening to music full blast and staring into the abyss of our never-ending Facebook news feed effectively makes us deaf and blind,” he writes, and eminently vulnerable to the predators among us. 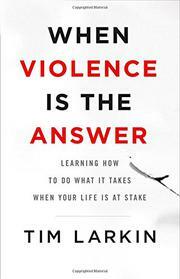 While noting continually that violence moves any argument onto ground that you can no longer control, the author allows that there are times when the only response is just that; in any violent encounter, he urges, “the real edge goes to the person with the willingness and the training to get the job done.” His book amounts to a kind of notional manual geared more toward reconciliation with the fact that it’s an ugly world in which “asocial violence” is rampant rather than a practical guide to pressure points and guaranteed knockout punches—though there certainly are mentions of such things. As the narrative draws to a close, we find Larkin celebrating, more than once, the satisfaction that comes from rhythmic smacking and hearing the crunch of an enemy’s bone, all thanks to the fact that readers, now convinced that the world is indeed an arena of Darwinian struggle, have become “explosively efficient.” Atavistically so, one might say, but given that the headlines would seem to bear Larkin out, it might be just the attitude to adopt. The repetition may be maddening, drilled into readers like a kata, but Larkin provides some useful nuggets for these fraught times. And remember: violence is always the last resort—even if you’re a ninja.